With March in full swing, winter is finally coming to an end and Spring is just around the corner. There’s no better way to enjoy all of the benefits of Spring than to hop over to your local farmers market and pick up some in-season produce! Eating with the natural cycle of produce compliments the body’s healing process. Spring-time leafy greens help detox, alkalize and restore the body to a healthy weight, shedding extra winter pounds. Buying locally and seasonally also means you are supporting farmers and helping cut fossil fuels used to transport produce long distances. You might not know it, but often you could be buying produce from another country. Due to weather and geographical location, in-season will mean something different depending on where you live. But shopping at the farmers market will pretty much ensure you’re getting locally grown, seasonal produce! 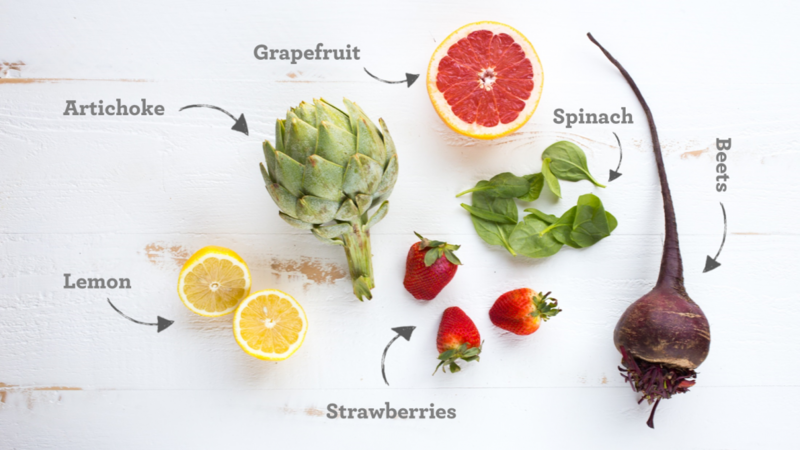 Here are 6 of our favorite late winter/early spring seasonal fruits and veggies! Beets: Beets definitely don’t get enough love! This gorgeous red veggie is fantastic for cleansing the body and they’re high in vitamin A, B & C! Eat them on their own or add them on top of your favorite salad! Strawberries: Strawberries may very well be the world’s favorite berry. And, for good reason! Strawberries are extremely versatile when it comes to cooking and pack a huge punch of nutrition. They are an excellent source of vitamin C as well as antioxidants, and have a lot less sugar than the majority of fruits out there. Indulge in strawberries guilt-free this spring! Artichoke: Artichokes may look a little unique, but that doesn’t mean you should be hesitant to buy them! Artichokes are extremely high in antioxidants  and make a delicious snack when dipped in butter, ghee or coconut oil! “Health Benefits of Grapefruit”. Organic Facts. n.p, n.d. Web. 2 March 2016. Dumas, Kelly. “6 Health Benefits of Eating Beats”. Full Circle. n.p., 10 May 2012. Web. 2 March 2016. “Strawberries nutrition facts”. Nutrition and You. n.p, n.d. Web. 2 March 2016. Ten Bosch, Laurentine. “16 Health Benefits of Drinking Warm Lemon Water” Food Matters. n.p., 2 January 2014. Web. 2 March 2016. Selcke, Taylor. “Fit Food: The Benefits of Spinach”. Men’s Fitness. n.p., n.d. Web. 2 March 2016. “12 Unexpected Artichoke Health Benefits”. Ocean Mist Farms. n.p., n.d. Web. 2 March 2016.